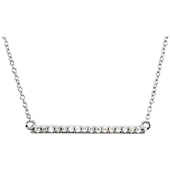 14k white gold Sparkly V necklace with pavT diamonds on a beautiful 18 inch cable chain. 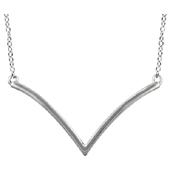 It's great worn on its own or layered with other pieces. 16 I2 Clarity, H Color diamonds have a total carat weight of .14 carats. Pendant measures 14mm x 28mm. 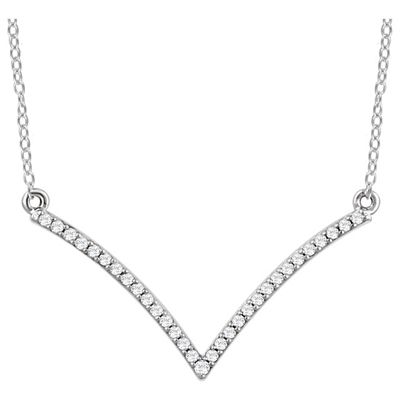 We guarantee our 14K White Gold "V" Shape Diamond Necklace to be high quality, authentic jewelry, as described above. 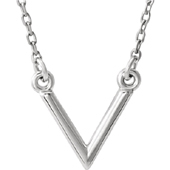 14K White Gold "V" Bar Necklace, 16-18"